This dish was part of our Meal Plan a couple of weeks ago. Since I linked up to the original recipe, I wasn’t going to report on it here again but then I realized that over the years I have changed up the recipe to suit our needs better. So here is our version. Don’t be afraid of the polenta, it is super easy and this is one of my favorite ways to make polenta as it stays quite soft and creamy. And I am sorry that the picture isn’t more appetizing – it really is delicious! Serve with a tossed salad to get in your green vegetables. Heat the oil in a skillet. Add onions and saute until they are beginning to soften. Add pepper, garlic and bay leaf. Saute 2 minutes. Stir in the water and beans. Cook until the beans are heated through. Stir in vinegar, salt and pepper. Discard the bay leaf and serve over the polenta with parmesan on top. To make the polenta, bring the water and salt to a boil in a large, deep pot. (Polenta will bubble and splatter.) Reduce the heat to medium and slowly whisk in the cornmeal to avoid lumps. Whisk until it thickens, about 5-7 minutes. Remove from heat. Stir in the butter and cheese and serve. * Onions – we like a lot of onions. You can use less if you’d like. 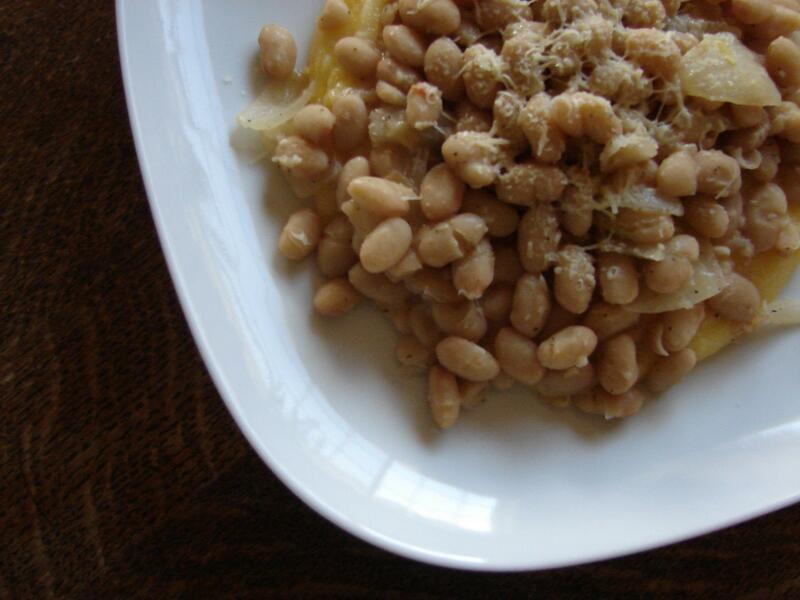 * White Beans – I use either Great Northern or Cannellini beans. Both work. * White wine vinegar – It can be found with the other specialty vinegar at your local grocery store. We like vinegar and we like to taste it, so I use a lot in this dish. You can use less if you’d like. * Salt – I don’t always salt my polenta water. It won’t affect anything if you don’t use it. Almost two weeks ago now, in a Meal Plan Monday post, I mentioned that we were going to be trying a recipe from Susan at Fat Free Vegan. Be sure to check out the original recipe. We have tried quite a few of Susan’s recipes and especially enjoy a couple of her tofu recipes: Chipotle Barbecued Tofu and Sichuan Tofu with Garlic Sauce. This recipe caught my eye because we love chickpeas (but unfortunately, not asparagus). I have substituted broccoli before in other recipes calling for asparagus and so I was happy to see Susan suggest it as a substitution. And when I saw that she cooked her polenta in her pressure cooker, I wanted to give that a try too as I have only made soups and beans in my pressure cooker since I got it in January. So I made the polenta in the pressure cooker but it didn’t go as smoothly as I had hoped. I usually make polenta in a heavy pot and have had continued success with that technique but I am not sure what I did wrong with the pressure cooker. The polenta began to burn on the bottom but we were able to scrape enough off the top, missing the burnt parts. I will likely try making polenta with my pressure cooker again although I am not sure it is any easier or quicker than the way I usually make it. Instead of the asparagus called for in the original recipe, I used broccoli, which I steamed in a steamer basket on the stove. I added the lemon juice and peel just as Susan did. I made the chickpeas per the original but I doubled the amount it as I wasn’t sure it would be enough for us as well as for a bit of leftovers. Unfortunately we were not thrilled by this recipe (although many people have reported great results over on Susan’s page). 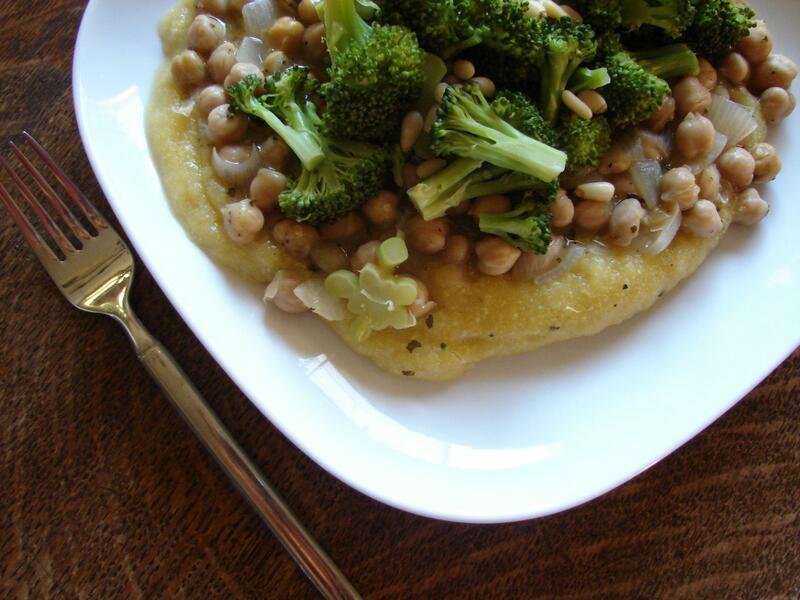 The chickpeas in their sauce were not very flavorful, although the lemony broccoli was tasty. As for the chickpeas, I am not sure if it was because I used a different ‘type’ of vegetable broth and not an un-chicken broth. I used Trader Joe’s vegetable broth, my usual broth. And so I wonder if this was the difference because I found that adding quite a bit of salt to the chickpeas helped. Perhaps my broth wasn’t flavorful or salty enough? Or was I just ‘off’ that evening? Let me know if you try it as I can’t figure out where I went wrong.